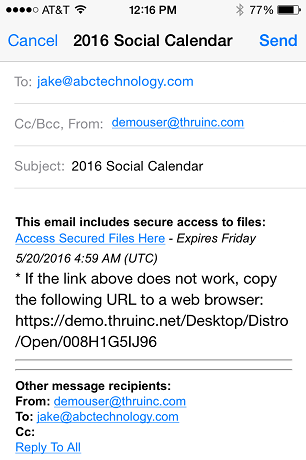 After the box is checked, touch the mail icon on the bottom left of the screen to begin creating your Thru Email. Before you can send your email, fill in the To field (also the Cc and Bcc fields if needed). 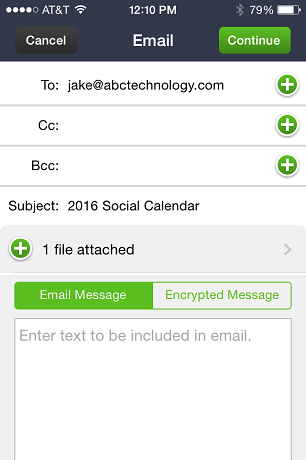 You can touch the green plus buttons next to each field to add contacts that are stored on your device. Next, create a Subject (required) and compose your email message. You can also create an Encrypted Message to protect sensitive information like IP Addresses and Passwords. 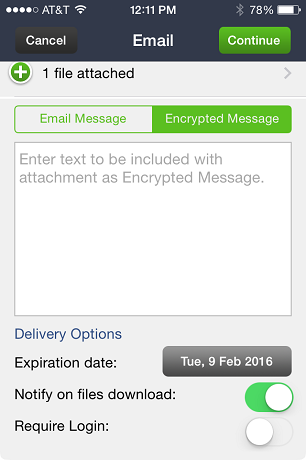 To create an Encrypted Message, touch the Encrypted Message button next to Email Message and compose your message. 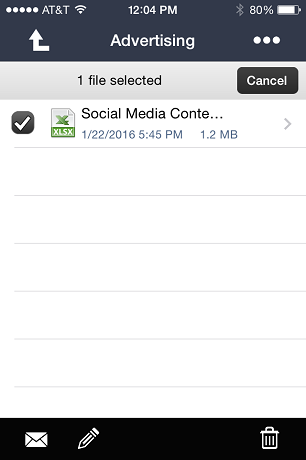 All files sent with Thru have an expiration feature that makes files unavailable for download after the set date. 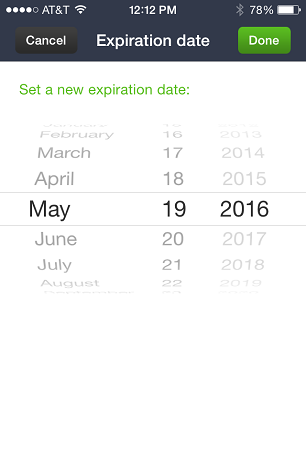 To choose the expiration date, touch the Date button under Delivery Options and set a date. 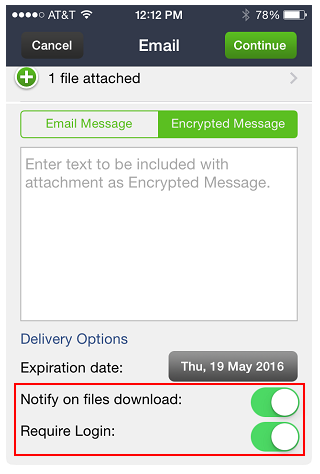 Other Delivery Options include “Notify on files download” and “Require Login.” Notify on files download will send you an email notification when the recipient downloads the files. Require Login will require all recipients to log in with a registered email and password before they can download files. To enable or disable these features, touch the green button to the right of each feature. When you are ready to send your Thru Email, touch the Continue button at the top right of the screen. This creates the Thru email message and opens within your iOS Mail app. To send your email, touch the send button in the top right corner.